Far away, in their village, her sister is mourning. Through her pain, she calls upon the desert winds, conjuring a subtle unseen magic, and something besides death stirs the air. Back at the palace, the words she speaks to Lo-Melkhiin every night are given a strange life of their own. Little things, at first: a dress from home, a vision of her sister. With each tale she spins, her power grows. Soon she dreams of bigger, more terrible magic: power enough to save a king, if she can put an end to the rule of a monster. At first, I got the... "I volunteer as tribute!" vibe when the girl swapped places with her sister. She was sacrificing her life so her sister could live. So... that's basically the same thing, right? This still did not deter me from the book by any means. The main character is one brave girl. Not only did she decide to die so her sister could live, but she decided if she was going to go die - she'd go out with a bang. She wanted to kill Lo-Melkhin. I mean, who wouldn't? Lo-Melkhin had killed over 300 girls - all of them his brides to be. But this time would be different. The girl tried something none of the other had... to pique Lo-Melkhin's interest. The first night, when almost every bride died, the girl told Lo-Melkhin a story. Soon dawn arrived and Lo-Melkhin agreed to let her live another day so he could hear the rest of the story. Throughout the book, the girl seemingly challenges Lo-Melkhin with her words, which of course just made him more curious. It soon become apparent that Lo-Melkhin isn't really himself and he has some sort of power. The girl starts to see this mysterious power during their long nights full of story-telling. Even Lo-Melkhin's mother can sense her son is different... changed somehow. All the while, the girl's sister and the people from the girl's village have been praying to the girl as if she was already dead and considered a smallgod for sacrificing herself. Now the girl starts to sense a sort of power within herself. Maybe now the girl can finally face Lo-Melkhin and prevent more deaths. 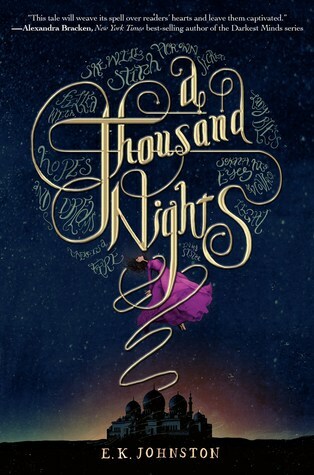 This book was a wonderful reboot of Arabian Nights... or at least it had a few similarities. I loved the main character and the snide comments she made to Lo-Melkhin all the while knowing she could be breathing her last breath. I recommend this book to everyone... seriously. Even if you don't care for the YA or fantasy genres, I still think you'll love it. Sounds very interesting. I've TBRd it on GoodReads. I think you meant "pique" not peak. I just got the book now I am even more excited to start this one! That cover is gorgeous. 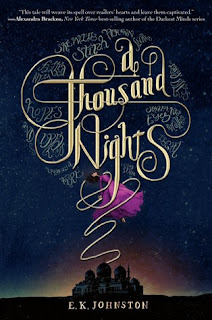 It's a good year for Arabian Nights re-tellings. I want to read this and The Wrath and the Dawn and compare the two. I don't know about this book but I think I will read it. The cover is so beautiful! !